Bringing teammates and gym buddies together for a high intensity workout with a Hi-Tri, three Versaclimber Club, Sport or LX models in close configuration, is becoming increasingly popular. Drawing people closer together for their workout adds a new dimension to training, whether users want to chat during a light training session, or get a little more competitive during a team workout, the Hi-Tri is the answer. Research shows Versaclimbing for 20 minutes or less, actively engages and tones all the major muscle groups and is more effective and time efficient than treadmills, ellipticals, steppers and bikes. 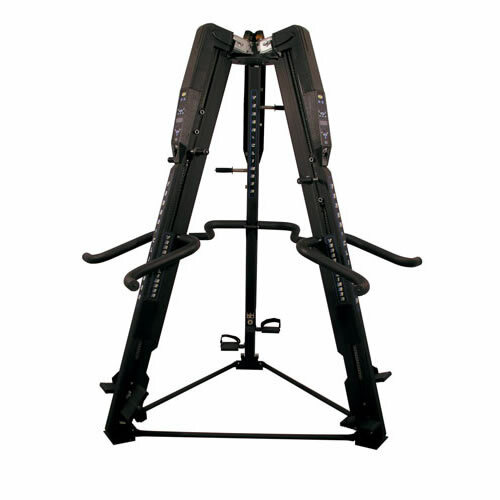 The Versaclimber offers the most comprehensive, total body workout available from any one piece of exercise equipment. It’s what’s made the company a leader in total body fitness for 33 years. When used for fitness classes the Hi-Tri can raise club revenues. Such is the intensity of a Versaclimber workout, class participants can achieve a full body workout in the space of 30 minutes, as opposed to an hour – freeing up machine time to host additional classes. Beginners and multi-level users in the UK and internationally are maximising their workout with the Versaclimber, giving the Hi-Tri strong group appeal. *It is a customer’s responsibility to ensure there is sufficient ceiling height and floor space available before placing an order with Versaclimber UK. Please refer to the product specification on our website and specific downloadable manuals for further details. For more information on the Versaclimber, read our FAQs page.